As discussed in a prior post, Macau was a Portuguese colony for almost 450 years, only becoming a semi-autonomous part of China in 1999. 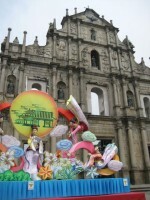 During this time, the Portuguese left an obvious mark on Macau. We took a taxi from our hotel to Largo do Senado, a square in the heart of the historic district. The Portuguese influence is immediately seen in the architecture of the beautiful buildings and churches surrounding the square. 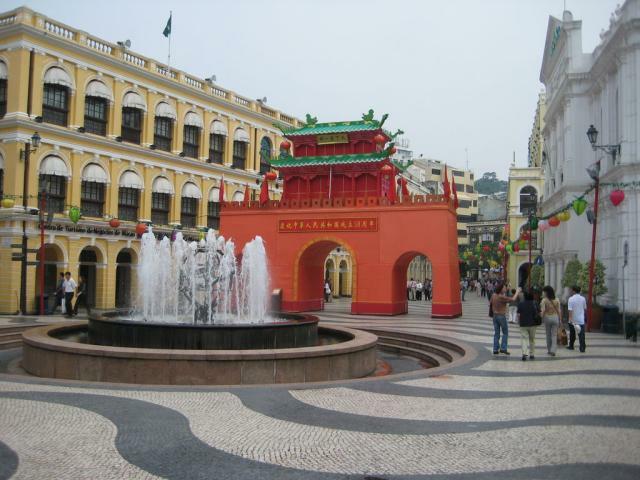 We then meandered through the narrow streets of Macau passing many shops and restaurants. 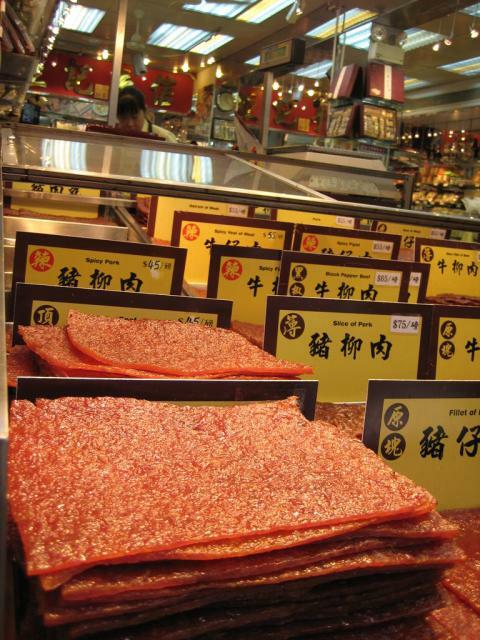 We walked by several shops where employees were passing out free samples of some unknown meat product. I have an unblemished record spanning over 30 years of never saying no to a free sample (whether from a Chinese restaurant in the mall or some old lady at Kroger or Costco), and I definitely wasn’t going to end my potentially Guinness-breaking accomplishment simply because I had no clue what was being offered. 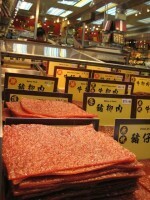 I held out my hand and the young lady used her scissors to cut a piece of foreign meat from a rectangular “meat sheet”. Within seconds of consuming my morsel, I was overwhelmed with the need to have more…NOW. Without shame, I begged for another sample of the meat (which I believe was pork). Realizing that 2 pieces was not enough, I broke down and bought a piece of the meat sheet. The incredible taste is hard to describe; it’s most akin to jerky, but infinitely better. I quickly swore that I would make it my lifelong mission to re-create the meat sheet in my own kitchen once we return to the States so Americans can share in the joy the meat sheet provides. After having my fill, we continued our walk until we reached the ruins of the church of St. Paul’s. The church, which was built in 1602 by Japanese Christians who fled persecution in Japan, burned down in the mid-1800s. All that remains is the facade of the cathedral and the crypt underneath (where bones of Japanese martyrs are displayed). It is an eerie, yet beautiful reminder of the Christian religion that thrived here during the Portuguese era. Some say it is the greatest monument to Christianity in all of Asia. 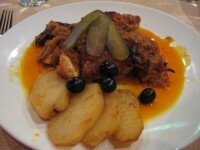 After getting lost and receiving directions from some very helpful Macanese locals, we found Restaurante Litoral – a well-known Macanese restaurant here in Macau. We trusted our guidebook and ordered the African Chicken (chicken that is slowly cooked in a sauce that is a blend of chilies, garlic, coconut and other spices) and Baked Salted Codfish (a Portuguese speciality that is still loved in Macau). If you’re a chef, try to find recipes for both of these dishes and put them on your menu. They will both be bestsellers. I can’t confirm this (but I’m fairly positive) that I saw a tear of joy in Shanna’s left eye as she tasted the salty goodness of the codfish. I can usually trust her to share a good portion of her meal, but there was no chance today. This was one of the best meals we’ve had on our trip. Finally, we visited the A’Ma temple. The temple was built on the site that A’Ma, a legendary woman who survived a terrible storm while on a ship, landed and then ascended into heaven. 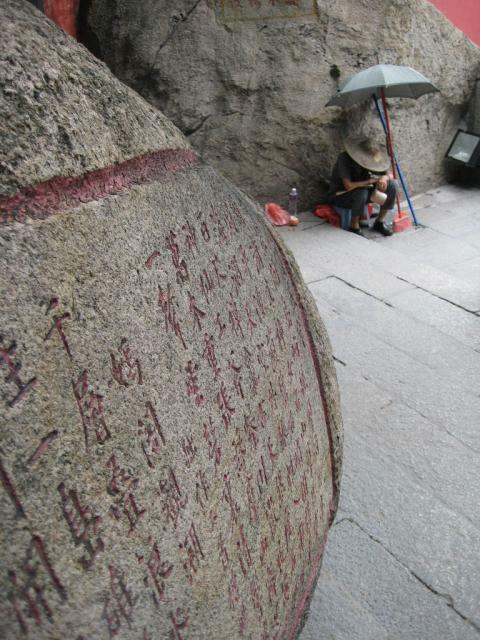 The temple, which is built on the side of a hill, was filled with Chinese tourists offering money and incense to the shrines at the temple dedicated to various gods (including A’Ma, the goddess of seafarers). It was an interesting site and a great way to end our visit to Macau. [It’s Kind of Like] Vegas, Baby! Comments Off on [It’s Kind of Like] Vegas, Baby! Macau has an interesting history. 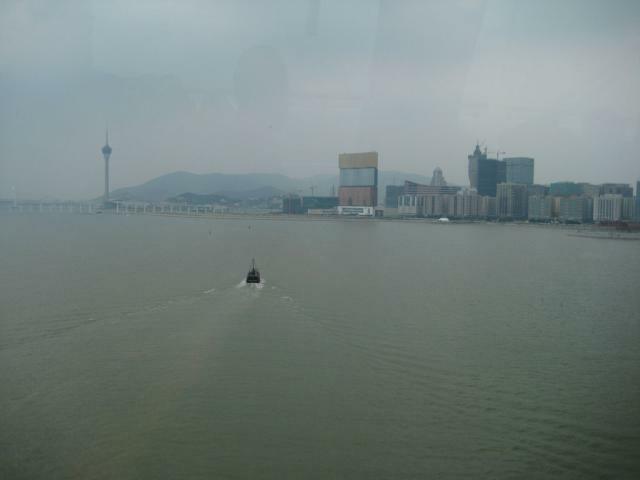 In the 16th century, the Portuguese began trading with the Chinese and, in 1557, were granted the small islands of Macau (located a few miles off the coast of China on the South China Sea) as a reward for driving away the pirates that inhabited the area. It became a huge trading port of call for the West, but began a rapid decline when the British were granted the islands of Hong Kong (only an hour away by speedboat) in the mid-1800s. 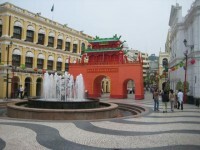 Macau remained under Portuguese control until 1999 when it was handed over to China as a semi-autonomous region of China (similar to Hong Kong, which was handed over to China in 1997). This semi-autonomous status allows the Macau government to control many of its own affairs without the supervision of mainland China (other than the areas of defense and foreign affairs). One major act of the Macau government was to legalize gambling, an activity that is banned throughout China and Hong Kong. The Chinese are notorious for their love of gambling. 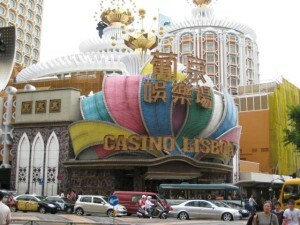 Several Chinese-owned casinos have taken advantage of this in the past, including the historic Casino Lisboa. It was only a matter of time before the West finally realized the opportunity in Macau, especially with the number of Chinese millionaires that have been produced by the incredible economic growth in China in recent years, earning Macau the nickname “Vegas of the East”. In the past couple of years, the Sands Hotel and Casino and the Wynn Hotel and Casino (a huge name in Las Vegas) have opened their doors, and, in just the past two months, the Venetian Hotel and Casino opened as the largest casino in the world. As you drive around Macau, you will notice many other hotels/casinos (including the Four Seasons, the MGM Grand and a Sheraton) under construction. Macau is undergoing a major boom. As one of our wedding presents, some friends gave us a couple of nights at the Venetian Hotel (which was reasonably priced due to the grand opening). When we checked in, we where overwhelmed by the size of the casino (much bigger than any casino I’ve seen in Las Vegas) and the size of our room (all the rooms are suites at the Venetian). Our excitement was quickly squashed when the ATM we used ate my ATM card (ok, it was my own fault since I entered the wrong PIN number 3 times in a row, BUT I realized later – too late – that the way the numbers are arranged on Chinese ATM keypads are the exact opposite as in the US…you live and you learn). The prospect of a few days (and maybe weeks) in China with no access to money was – to say the least – a little stress-inducing. You’ll be happy to know that a few panicked phone calls and two visits to the local office of Banco Weng Hang the next day ultimately produced my ATM card, which I promptly kissed. 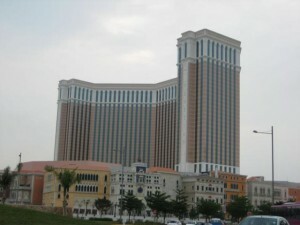 The atmosphere of a Macau casino is dramatically different than one in Las Vegas. First, it’s relatively quiet – they’ve turned off the sounds of the slot machines, and the Chinese (who are normally a very chatty people, from our limited exposure) are intense gamblers who don’t really talk or cheer while gambling (very different from the drunken outburts you witness at casinos on the Vegas strip). We also noticed that the Chinese don’t drink (a notorious pastime in Las Vegas) while they gamble, creating a much different environment. Finally, the games played in the casino are much different than in Las Vegas, with baccarat (which you’ve probably only seen in James Bond movies) and some game where you try and guess the sum of three dice that are rolled dominating the casino. I can’t forget to mention how many tables the casino had of the game War (yep, the game you played as a kid where you simply draw a card and see if it’s higher than your opponent’s card). It’s a 50/50 chance you’ll win, but – of course – the casino takes a huge percentage making the game a terrible bet. Regardless, the War tables were packed with people lining up to grab an empty seat! In my opinion, the real draw of Macau is not the casinos, but the historic colonial district of the Portuguese era and the great food. I’ll talk about that later. Beginning three days after their September 2, 2007 wedding, Derek Hughey and Shanna Singh Hughey traveled the world for one year, visiting 40 countries in Asia, South America, Africa and Europe. This website is a chronicle of their journey.